I don't have a whole lot of recent experience with crafts, but I do have my girlie side. I've been known to leaf through Martha Stewart Living, and I occasionally do stuff around the apartment that could be construed as decorative or hobby-like. So I can believe what they say about craft-making being one of the most relaxing hobbies around. But as with anything else, too much of a good thing can be bad for you. Have a look. They're not stupid. 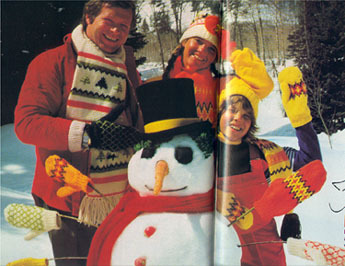 They know that a snowman doesn't need six arms, all embellished with mismatched mittens. It's obvious that their friends are sick of receiving their stupid knitted scarves, done up in colours and patterns that never match anything in anyone's wardrobe. They realize they should stop knitting for five minutes and do something else, like maybe clean their house or watch some television. But they just...can't...stop. I think the anguish peeking through their hollow masks of jollity says it all. Somebody, please, stop them before they craft again. This is just half the picture, literally. The book was too big for me to fit the entire thing on my scanner, but I can tell you that the right-hand half of the picture features 22 more crafted kitties, most of them as lame as the ones in this photo. What do you see when you look at this picture? I suspect the intended effect is for the viewer to think, Hey, these crafts are easy enough to be made by an older person who may have problems with her vision or arthritis in her hands. Isn't it great that she can make so many crafts! But for me it evokes something more along the lines of a family who haven't been by for a visit in quite some time and have no idea of the avalanche of crafts piling up in her bedroom. 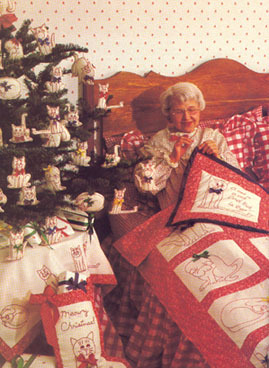 Is this sweet-looking older woman not aware that a world exists outside her cat-craft-filled house? Is she in a craft-induced stupor so profound that she doesn't even notice she's just sewing the same poorly drawn and not even very cute cats over and over again? If her fire alarm went off, I'm not even sure she would be able to wade through all the crafts to exit the building. This is just wrong. At the very least, an art director over at Better Homes and Gardens should have gotten the boot for this condescending, stupid layout.